Maria was born and raised in Denver, Colorado. 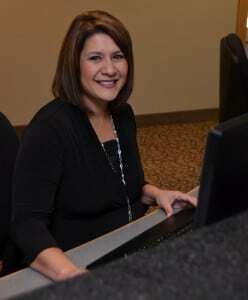 She has worked in the dental field since 1994, and in management since 1996. Maria is very passionate about working with patients and making each dental experience a comfortable, stress-free visit. She has been happily married since 1992 and has 3 beautiful adult children. In her spare time, Maria enjoys cooking, watching football and spending time with family. Colleen is a Colorado Native and loves spending time outdoors. She has been a dental assistant for 11 years with advanced EDDA training. Colleen enjoys assisting during cosmetic dentistry cases and seeing how much it can change a person’s smile – she loves to see the excitement and happiness on each patient’s face once cosmetic dental procedures have been completed. In her free time, Colleen enjoys working out, dancing, reading books and having lots of family time.